Whilst a university student in the early 1990s, I wrote several Atari ST games which were published on cover discs of various magazines including Atari ST User and Atari ST Review. These weren't boxed big-name games, they were bedroom coder affairs which today would be considered "casual" games, or at least they would if they weren't already considered "retro". I have now granted all my Atari ST software into the public domain. There is no need to contact me, you may use them in any way you see fit without any further permission, but you're welcome to email me: andrew@aoakley.com . 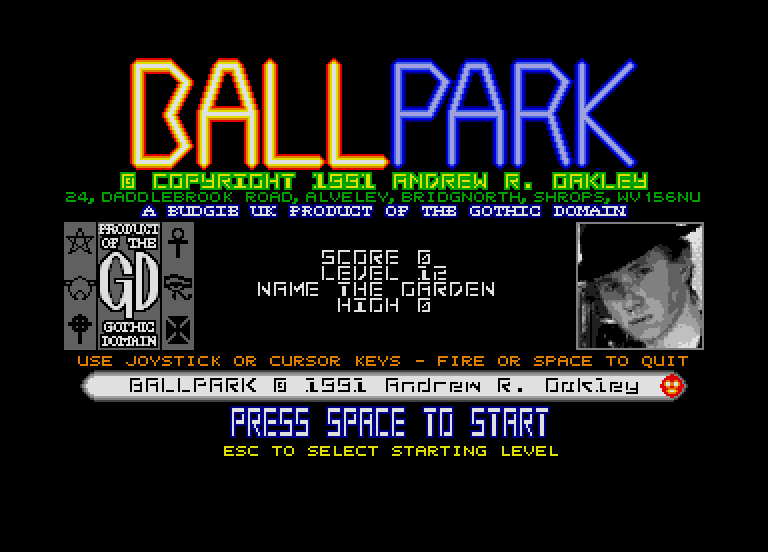 Whilst I do still occasionally receive shareware registrations from the old postal address, I am unable to post registered disk versions of the games in return; the registered versions are available to download here including all the exclusive extras like level editors, level randomisers etc. Registration monies will be returned together with a print-out of this page. These are all zipped .st files. They were programmed in STOS. The files were taken from my original master floppy disks (except Ballpark, for which my originals were unreadable, instead I present an image found circulating on various retro scene websites, which as far as I can tell is a pefect copy of Budgie UK disk 85). These files have been tested using the Hatari emulator and will almost certainly work with both a real Atari ST and almost any emulator out there. I recommend using TOS 1.04 but they should work with any 1.x TOS ROM. Enable 1MB memory if not enabled by default, as at least one of these games gives you extra sound samples if you have the headroom. If you have an actual Atari ST, the you can write .st files to a floppy disk using FloImg under MS-Windows or the dd command under Linux/Mac. Released as licenceware through Budgie UK. Made a few quid every month for a few years. 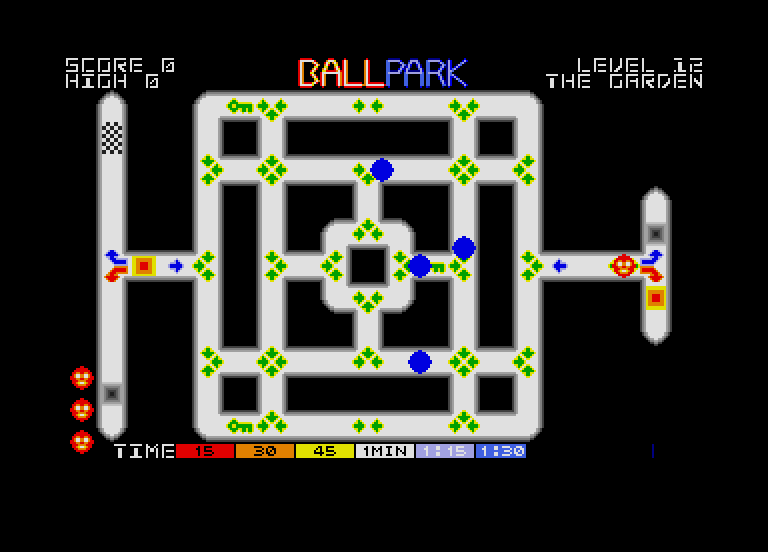 The game played like a cross between Marble Madness and Pac-Man. You could only change direction when you reached a set of arrows. There were also filter arrows which would send the monsters one way but the player another; collecting keys changed these arrows and allowed you to kill the monsters by forcing them down a hole. A nice mix of arcade gameplay and puzzle; despite this not being my biggest earner nor the one most people remember me for, I think this one has the best design of my Atari ST games. A puzzle game. This is the original version, which I sold to Atari ST User magazine, who had it on their cover disc in 1991. I got paid quite well for it, as I recall. The object was to turn all 9x9 tiles the same colour, using three 3x3 templates. Starts easy, gets hard quickly, but after a while you can figure out a method no matter how complex the board is. I also released a charity fundraising version which had a level randomiser. Square Off. First version of this, I sold to Goodmans disc library in 1990. Second version I sold to Atari ST Review for their cover disc in 1991, with an offer of sending people a level editor if they registered it for a fiver. I still occasionally get shareware registration fees for this twenty years later, for five quid I'd send people a level editor. I think the last few registrations I had to return the cheques uncashed as for many years all my ST stuff was sat in my parents' attic. 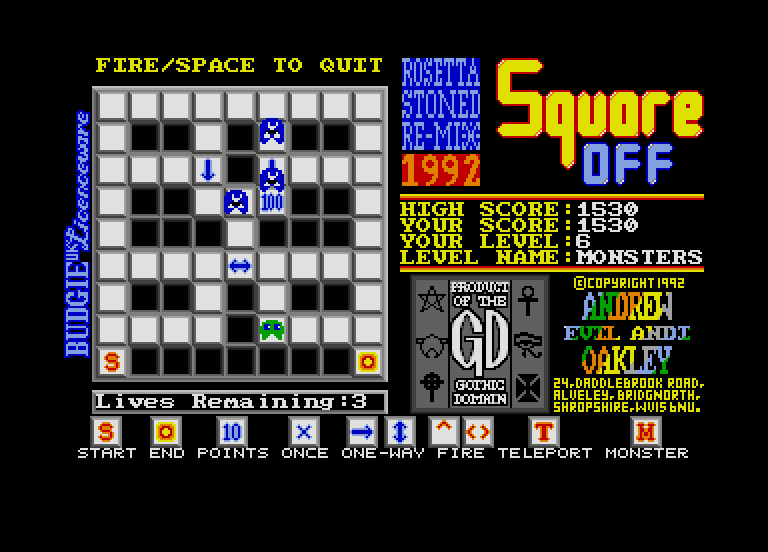 Then finally there was the Budgie UK version ("Rosetta Stoned Re-mix", pictured) in 1992 which included an entirely new set of 50 levels plus the level editor. Former school friend Malcolm spent a solid weekend with the level editor creating the new levels for the remix, I ran out of time for the publishing deadline; I think I was due back at college and had some coursework to do. This game earned me well over a thousand pounds in shareware registrations, which was a lot for student in the early 90s, and especially for something I'd have knocked up for a laugh anyway. It seemed that offering a level editor was a real draw to encourage people to pay for the game. Five pounds also seemed to be a nice price point. Five quid is a price sweet spot. Always put a sunset clause in shareware registrations. I still occasionally get registrations today, about twenty years later, which I feel guilty about as I am unable to honor them. Put something in the registration offer text such as "for N years after release". Never try to save money by formatting storage media in non-standard ways to get extra storage for free. You just end up making your work unreadable twenty years later, and swearing at your younger self. If you insist on using copyright to protect your income or rights, for stuff you'd do anyway as a hobby, consider putting an early sunset clause on your copyright. Include in the copyright text, something like "This software will be granted into the public domain ten years after release". I got a lot of very detailed emails from people asking for permission to host my games on all manner of retro websites, which whilst flattering was nevertheless tedious. I strongly feel that copyright law is actually working against the retro scene in a manner far beyond the wants of most software authors. These are little things I knocked up as a hobby, they were never going to pay the rent and I knew that from day one. It annoys me that copyright defaults to such a long period, it should be around 5-10 years I think. If you're not in it for the money, release everything you do as a hobby, as public domain, or at least freeware. It saves hassle managing the whole thing, and gets your work distributed more widely more quickly. The GPL and other licences such as CC-BY just create more management hassle than they're worth - are you really going to police it? The irony is that the distribution of these games on magazine cover discs, for publications which had a readership around thirty thousand per issue, may well have brought them to a wider audience than many boxed games in the lower reaches of the charts. I certainly got, and still get, my name recognised by complete strangers solely due to these games. I intend to make my other Atari ST software available on this page, as my spare time permits. I think this comprises of a quiz construction kit, a disc magazine construction kit and a results system for village marathons. I have no further plans to write any more Atari ST software. I may consider a re-write of Flipped for a mobile or casual PC platform, but unfortunately I don't have much spare time. I now manage software developers and the software development lifecycle as my day-job. I also occasionally do some hobby programming in Perl, PHP and Bash, notably under Ubuntu Linux. Some source code disks still survive, I may put these online at some point.